France is such a varied country that we can only give an glimpse based on our travels in recent years. We have toured through many regions and Departments which are detailed in the links below. We have also visited Britanny, the Morvan and Yonne areas a few more years ago. We have highlighted some of the smaller "undiscovered" places that we have happened across sometimes by accident when getting lost along the maze of D roads. Although the countryside appears rather flat with rolling hills there are some interesting places we have discovered, often tucked away towns and villages. 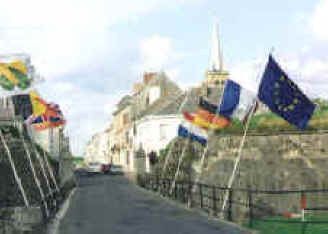 Rocroi, a fortified town near the Belgian border is worth an overnight stay. Further east are the Vosges mountains, mainly wooded but there are some small resorts and interesting scenery. Take a short pause in St Die where le Corbusier lived, before driving over the Vosges mountains via the Ste Marie pass to the Alsace region. Not difficult driving and there are fine views down to the Rhine valley and the tourist town of Riquewhir among the vineyards, where there's a shop selling Christmas decorations all year. 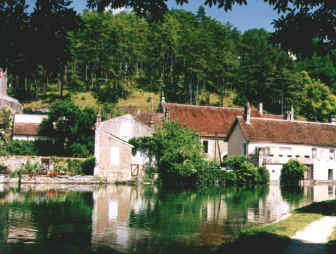 Druyes les Belles Fontaines is a delightful serene village with sparkling clear millponds and a chateau on the hillside. There is a shady aire de pique-nique on the hillside just past the ponds. Nearby is St.Fargeau where there is a large Son et Lumiere event during August and the Reservoir du Bourdon with pleasant wooded parking areas. This little toured area known as la Puisaye is between the Loire and Burgundy and has some surprises including a complete rebuilding of a medieval chateau by traditional methods at Guedelon. Ispagnac at the eastern end of the Tarn Gorge has a pretty old village centre worth visiting on foot from the campsites nearby. The old streets have been restored and there are some charming houses and lanes. Its best to take the gorge road in a west to east direction to avoid the overhanging rocks. Take the road north from La Malene up to the Causse de Sauveterre and west to the Point Sublime for fantastic views. In this "wild" countryside we came across a local village football pitch complete with advertising signs in the middle of nowhere! 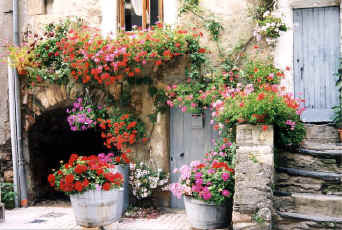 Where does one start to describe the wonderful picturesque places and magnificent scenery of this region of France? It has a distinctive Mediterranean feel that has made it such a popular area yet we have found many small villages and tucked away places not far from the busy towns and cities of the Rhône where you can be alone. There are extensive vistas of lavender fields, rough countryside, mountains lakes and gorges. It is best to avoid the overcrowded coastal strip especially in high season of July and August, but a few miles inland is a different world of shady town squares with their fountains and colourful markets. The mountain range separating France from Spain has a different character on the French side and we found it more accessible. "Exploring Rural France" by Andrew Sanger. Another guide that travels with us if there is space is "Secret France" published by the AA a few years ago but occasionally seen in discount bookshops. Also we use various Michelin Green Guides covering the areas of France (some only available in French) but these tend to have more details on historic buildings rather than countryside. Please contact us using the feedback link if you would like more details of places we have visited.